I am naturally very pleased to be discharged from hospital and would like to take this opportunity to pay tribute to every single member of staff at The London Chest Hospital who have played a part in my care. Their dedication, professionalism and expertise is simply amazing and I will forever be in their debt. I also wish to say thank you to all the many well-wishers who have sent thousands of messages of support. Now I am out of hospital, I am looking forward to continuing my recovery and spending precious time with my family." Bolton Wanderers footballer Fabrice Muamba was today discharged from hospital, almost a month to the day after he suffered a cardiac arrest during a game. Midfielder Muamba collapsed on the pitch in the first half of Bolton's FA Cup quarter-final at Tottenham Hotspur on March 17, with the game subsequently being abandoned. The former England Under-21 international received treatment on the field before being taken to the London Chest Hospital. It later emerged that it took 78 minutes for his heart to start working unassisted. He was discharged from hospital today and paid tribute to staff who cared for him. 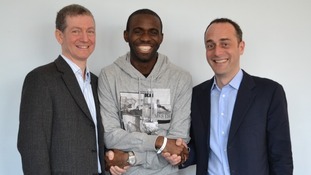 Barts Health can confirm that Fabrice Muamba has now been discharged following several weeks of treatment. All our staff wish him the very best in his ongoing recovery. Bolton manager Owen Coyle has paid tribute to Tottenham Hotspur, for the club's reaction following Fabrice Muamba's collapse at White Hart lane 10 days ago. Speaking at a press conference yesterday, Coyle said that the fans and the club had shown their 'quality' through their support for the Bolton player. The FA Cup quarter-final, which was abandoned following Muamba's cardiac arrest, is being replayed at the Tottenham ground tonight. Both teams' shirts will be auctioned off after the game to raise money for the London Chest Hospital. Tottenham will play their rescheduled FA Cup quarter-final against Bolton later. The original game was abandoned following Fabrice Muamba's cardiac arrest. The Bolton player is still in intensive care but is said to be making encouraging progress. Bolton manager Owen Coyle has admitted there is no way of knowing how his players will react to tomorrow's return to White Hart Lane. "Because Fabrice is getting better, that allows us to play the match," said Coyle. "If it was different circumstances, it might be a different conversation. "The great thing is that he is getting better. "We will do our best, as we always try to do. Will it be emotional? Of course. But I can't say how it is going to be until we are physically there." The Arsenal Manager Arsene Wenger has said he hopes Fabrice Muamba will recover to play football again. Muamba began his career at Arsenal before moving to Birmingham and then Bolton. Wenger said the midfielder always made an extra effort when he played against the Gunners.